Chamber Music Exchange, Inc. (“CME”) is a Nebraska non-profit corporation that seeks to stimulate and foster interest, participation, appreciation and knowledge of chamber music, primarily in relation to the cultural traditions of Turkey and the United States. CME intends to focus on providing support for chamber musicians and chamber music exchange and collaborative programs between performing artists, composers and music students, primarily from the United States and Turkey through support of educational programs, performances and commissions of new works by composers. CME’s primary activities will include providing grants for students in Turkey to attend chamber music workshops and summer courses in the United States and for students from the United States to attend similar workshops in Turkey or other countries in the region; assisting music professors by supplementing university grants in order to obtain sufficient funding for chamber music performances, workshops and premiers of new works; assisting programs that examine cultural intersections in the United States and Turkey through the language of new and old musical compositions; enhancing global and cross-cultural learning; and enabling initiatives that are designed to keep live chamber music in the daily life of the communities in Turkey that would otherwise have no access to hear chamber music. These activities will benefit the public generally by increasing the opportunity for participation and exposure to chamber music and by fostering opportunities for those student musicians who would otherwise be unable to secure funding for an important, but underappreciated and underfunded musical genre. CME will provide funding, scholarships and/or grants for individuals and programs that will further CME’s goals set forth above. With respect to funding and financial support, CME will not restrict itself to a single organization, but will review and determine the propriety of funding any program that will further its exempt purpose, enhance the accessibility to chamber music, and further stimulate the cultural traditions of small performing ensembles both in Turkey and the United States. CME intends to sponsor numerous types of grants to support various programs that further its goals stated herein, but such grants shall vary and change over time, all the while maintaining a focus solely on supporting the goals stated herein. Additional information is provided in other answers, but CME anticipates supporting organizations that operate chamber music programs primarily in the United States and/or Turkey. 2.a. Ellen Jewett is Janet Jewett’s daughter. Ellen Jewett is a violinist and has performed in Europe, Japan, Africa and New Zealand and throughout the United States in major venues such as Carnegie Hall, Weill Recital Hall, Alice Tully Hall, Merkin Hall, the Kennedy Center, both as recitalist and with groups such as the American Chamber Players, the New York Chamber Soloists, New York Chamber Ensemble, Continuum, and the Apple Hill Chamber Players. Ms. Jewett is a member of the Audubon Quartet with whom she has been performing since 2000. She is also a founding member of the contemporary music ensemble, Ensemble X, as well as the Taliesin Trio with whom she has been in residence at the Tanglewood Institute and the Spoleto Festival in Italy. Ellen Jewett’s chamber music collaborations include performances with Yo Yo Ma, James Buswell, Eugenia Zuckerman, Anthony Newman and Colin Carr. An avid performer of contemporary music, she has performed many premiers and worked with such composers as Phillip Glass, Shulamit Ran, John Harbison, Leon Kirchner and Steven Stucky. Ms. Jewett has recorded for Centaur, Chandos, Albany and Newport Classics. Ms. Jewett has served on the string faculties of McGill University, SUNY Stony Brook, Ithaca College, Istanbul University, State Conservatory, the Chautauqua Institute, and the Meadowmont School of Music. She has served as one of the concertmasters of the Borusan Philharmonic as well as the Istanbul State Symphony Orchestra. She has served on boards for several nonprofit organizations related to chamber music and music festivals. She currently divides her time between the United States and Istanbul, Turkey. Duties: President, Board member, primary contact with Turkish and Eastern European chamber music programs. Richard Faria is a clarinetist and an associate professor of music performance at Ithaca College. He has an active career as soloist, chamber musician, and educator. Faria has extensive chamber music experience. Faria co-founded the music group Ensemble X, which made recordings of chamber music by Steven Stucky and by Scottish composer Judith Weir. He has been a participant in numerous chamber music festivals. He has collaborated with such diverse groups as the Zephyros and Sylvan Wind Quintets, Atlantic and Arianna String Quartets, Composers Concordance, Guild Trio, Mother Mallard, and the Young Composer’s Collective in Seattle. He has performed in Weill Recital Hall, Carnegie Hall, Merkin Hall, The Kitchen, Miller Theater, Spivey Hall, the Smithsonian Institution, as well as at the American Academies in Rome and Berlin, Netherlands' De Lakenhal, and the Temple of Apollo in Turkey. He also jointly founded and directs the Ithaca Contemporary Chamber Ensemble, a student/faculty new music ensemble at Ithaca College. Faria has released several solo CDs and has also recorded for Newport Classic, Koch International Classics, and Mark Records. He is also a contributing author to The Clarinet magazine. Cellist Greg Hesselink leads an eclectic musical life performing with the Naumburg Award winning New Millennium Ensemble, Sequitur, the Locrian Chamber Players, Argento, New Band, the Mosaic Quartet, and as principal cellist of the Riverside Symphony. A former member of NY Philomusica, the Manhattan Sinfonietta and the Bang On a Can 'Spit' Orchestra, Greg has also performed with many of NY's other leading new music ensembles including Speculum Musicae, New York New Music Ensemble, Da Capo Chamber Players, the Group for Contemporary Music, Argento, the Flux Quartet, and with the dance companies of Cedar Lake, Mark Morris, Merce Cunningham and Nai Ni Chen. Performance venues include the Lincoln Center Chamber Society, Library of Congress, Donaueschinger Musiktage (Germany), Spoleto (Italy), Salihara Festival (Indonesia), Music for Museums (Ireland) and other festivals throughout north America, Europe and Asia. le Hill and is a regular participant at the Monadnock Festival. He is the string representative for the Mannes School of Music and is the president of the board of New Millennium Ensemble. Janet Jewett received her BA from Nebraska Wesleyan University and a Masters in Voice from Roosevelt University in Chicago. She maintained an active vocal career performing in the United States and Europe as well as teaching voice at Morningside College in Sioux City, Iowa. Janet Jewett has experience in nonprofit governance. She has served as the secretary and treasurer for home cooperatives in Evanston, Illinois, and is currently the internal auditor of her cooperative in Lincoln, Nebraska. She has also served as the vice president of the local chapter of Alpha Gamma Delta Alumni Association. Duties: Secretary, Treasurer, Board member. 5.a. CME has adopted a conflict of interest policy by resolution through unanimous consent minutes in lieu of a board meeting. A copy of the conflict of interest policy and the consent minutes adopting the policy are attached to these supplemental answers. 1.a. CME intends to provide grants to individual music performance and composition students to attend chamber music workshops and summer courses in the United States and abroad (at least for the near future, the courses abroad will be primarily located in Turkey). The grants provided by CME will help cover transportation or tuition costs. CME also intends to provide grants to professors in college music programs to supplement university grants that will allow the professors to collaborate on chamber music projects, commissioning of new chamber music compositions, and workshops with international musicians in their field. For additional information on these grants, please refer to the narrative description provided above and the discussion of Schedule H provided below. 1.b. CME may provide grants to other organizations to support specific chamber music projects, such as festivals, seminars or workshops. At this time, CME does not know which organizations and which projects it will fund, but any grants to such organizations shall only be made if they further CME’s exempt purpose and are made in compliance with all internal protocol. For additional information on these grants, please refer to the narrative description provided above. 4.a. CME intends to use some or all of the following fundraising methods: mail solicitations, email solicitations, personal solicitations, foundation grant solicitations, government grant solicitations, and online donations on CME's website. CME has not determined any specific fundraising strategies yet, but it will review each potential fundraising idea prior to undertaking it to ensure it comports with all federal, state, and local laws. CME intends to design and operate a website where people can make donations online, but at this time such a website has not yet been developed and there is no specific timeline for this project. 4.d. CME has not determined all of the jurisdictions where fundraising may occur, but it is anticipated that the majority of fundraising will occur in Washington, D.C. and New York. However, CME would like to be able to solicit individuals and companies across the United States if it determines that there is a good possibility to obtain donations in other cities and states. Given the international nature of CME’s mission, CME may have opportunities to solicit funds from foreign individuals or organizations through its international connections, but no international fundraising efforts are anticipated at this time. CME will not fundraise for other organizations, and it does not intend to have any other organizations fundraise for CME. 4.e. CME will not maintain separate accounts for any contributors to control the use of funds. It is possible that CME will allow donors to specify which programs they would like their money to support (e.g., a donor may donate money specifically for scholarships to individual musicians for study abroad, for grants to professors for university collaborations or for commissioning grants to composers, but a donor will not have any control over the specific recipient of the donation or how the money is invested or distributed. All investment, distribution, and control of donations shall be undertaken by CME. 11. CME does not have any specific intentions of accepting the types of contributions listed in Part VIII, Question 11, but it would be willing to consider such gifts if the opportunity became available. Before accepting any of these types of contributions, the Board of Directors or a sub-committee organized thereunder will review any potential gift, ensure that the contribution comports with all federal, state, and local laws, and enact the necessary policies to properly accept such gifts. 12. CME will be based in the United States. However, because of the international focus of CME, there will necessarily be some connection with foreign countries. Since CME will help fund grants for international programs, it will need to work with foreign organizations offering the workshops, conferences, etc. CME will not be “operating” in any foreign countries as much as reviewing, collaborating with, and funding organizations in these foreign countries and working with them to ensure that any funding furthers CME’s exempt purposes. Please see the answer to question 14 below for further information on CME’s potential connections to foreign organizations. 12.b. CME anticipates that the majority of its international activities will occur in Turkey. It is possible that it will also work with similar organizations and programs in other countries of the region, such as Greece, Georgia, Armenia, etc, but initially CME is focusing on Turkey. 12.c. Please see the narrative above for further information on CME’s planned activities and exempt purposes. The extent of CME’s operations in Europe is not known at this time, and it is likely that there will be no activities that constitute “operation” of CME in any foreign country, but rather CME will have connection to and contact with foreign organizations based on its international mission. As stated above, any operations in Europe would not only further CME’s exempt purposes, but are necessary to CME’s exempt purposes, including, for example, providing grants for music students in the United States to attend chamber music workshops and summer courses abroad and supporting programs that will expose the public to chamber music in the cultural traditions of Turkey. CME will be in contact with, and work with, organizations in Turkey and Eastern Europe to determine if their programs are appropriate for students to attend on CME grants, as discussed herein, or for funding of specific workshops or programs. 12.d. Please see the answer to 12.c. above. 13.b. The narrative and other answers provided herein should provide a sufficient answer to this question. 13.c. CME will require a grant application and other written submittals to document and control the relationships. The exact forms have not yet been determined. CME will have not a relationship with any applicant as defined by the IRS in the context of control, influence, shared resources, and common formation. It is possible that there will be some former professional connection with an applicant. It is possible that an applicant group may include musicians who have performed with a board member or a member of the selection committee considering the fact that the board members are internationally known. CME will disclose any professional relationships and will address any potential conflicts pursuant to CME’s conflict of interest policies. 13.e. CME will maintain records of all grant recipients and the amount of funding received by the recipient. These records will track the use of money and CME will require the grant recipient to document how the grant was used to further CME’s exempt purposes. Prior to awarding any grants, CME will ask individuals and chamber music groups to write a detailed letter of request to apply for any funding. 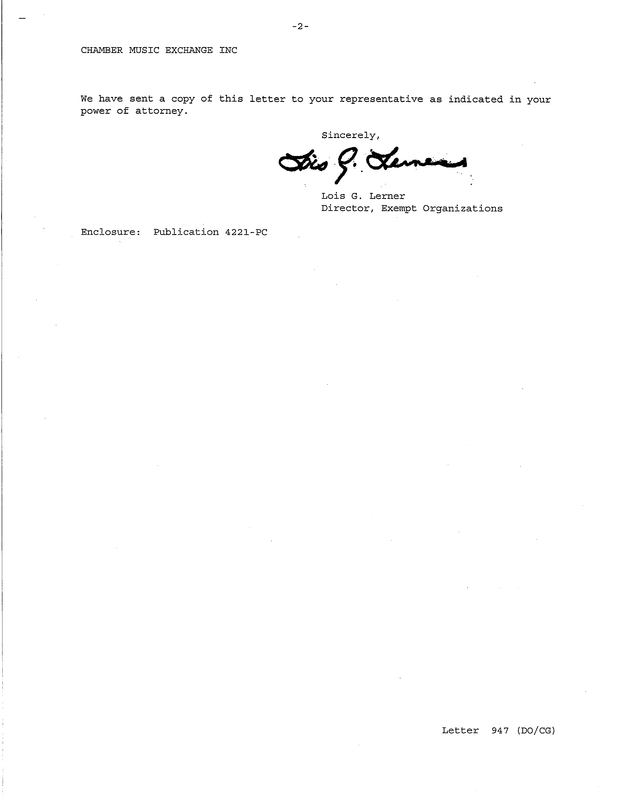 The specific required substance of the request letter has not been determined, but it will require an explanation of the program for which the grant is being sought, financial information on the organization, and other relevant information. It is CME’s intention to provide grants that would be supplemental funding to other funding sources. This will require any applying organization to have other sources of funding and to explain its need and how it will accomplish its program goals if it receives a grant from CME. All grants will be determined by a selection committee formed by CME. The selection committee shall consist of two directors on the CME board of directors and three outside members of the musical community. The initial directors on the selection committee shall be Ellen Jewett and Greg Hesselink. The three outside musician members of the selection committee will rotate each year. The selection committee will review each application to determine if the request furthers the mission of CME and if CME desires to support the applicant. The committee will vote on acceptance or rejection based on adherence to CME's exempt purpose and other policies that will be adopted or revised from time to time. CME will conduct oversight prior to, and after, distribution of any funds. CME will require proof that the project that a grant will support will take place before it will distribute an approved grant. 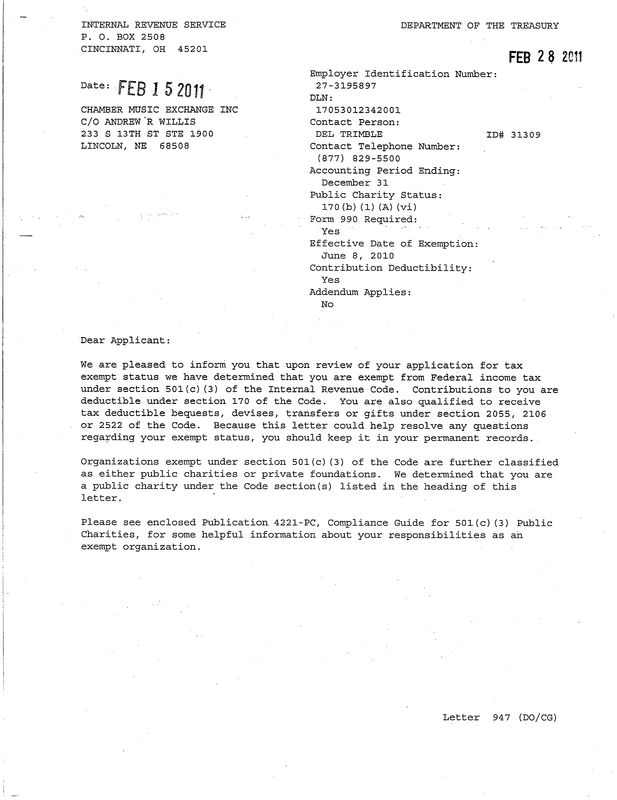 For example, if a chamber music group seeks funding to cover a portion of the entry fees into a festival, workshop or other program, CME will not distribute any grant funds without a letter from the festival, workshop or program sponsor acknowledging that the applicant has been accepted and admitted. As another example, if CME is providing funding for a portion of the costs of a collaborative performance or educational event, CME will require proof that the applicant has received or has the right to receive all the other necessary funding. CME will require a final report and accounting from all organizations that receive funding. The specific report and accounting will depend on the type of program for which the CME grant was used and the amount of the grant, but CME will set up policies and procedures to ensure that all grant recipients use the grant in the intended manner as set forth in their application. 13.f. See answer to 13.e. 13.g. See answer to 13.e. 14 For the answers to question 14, please also refer to the answers provided in answer 13, which are applicable to foreign as well as domestic organizations. Klasik Keyifler is just one example of a program CME may support. CME intends to provide funding for similar projects and similar foreign organizations that have not yet been identified. There is a relationship between CME and Klasik Keyifler. Ellen Jewett co-founded Klasik Keyifler in 2008 with her husband, Husam Suleymangil. Ellen Jewett also participates in some of the Klasik Keyifler workshops as performer and instructor. However, CME is aware of this connection and will follow all conflict of interest policies before providing any grants to Klasik Keyifler programs. More likely than direct grants, Klasik Keyifler may receive indirect benefits from CME grants. This would occur when CME awards a grant to music students in the United States to attend a workshop ran by Klasic Keyifler. But CME does not intend to offer special benefit to Klasik Keyifler. It is simply that Klasik Keyifler is one organization that is currently known to CME that offers the services and programs that CME intends to support. All funding decisions will be made in a neutral manner, following CME’s conflict of interest policies. CME will have control over where any grants or funding are used. 14.c. Klasik Keyifler operates in Turkey. 14.d. It is inherent in the nature of CME’s mission that its contributors know and understand that CME will have authority and discretion to fund foreign organizations that support its mission. Indeed, contributors that donate to CME will do so specifically because the organization offers support to chamber musicians and chamber music programs in the United States and foreign countries. The scholarships for study abroad, the international focus, and the multi-cultural opportunities to advance chamber music commissions and performance provided by of CME are essential to CME’s goals. CME’s mission and operations cannot be explained to a donor without highlighting the use of funds to support foreign chamber music programs. CME’s connections to foreign chamber music projects will be a selling point that CME will highlight on all solicitation materials. CME will maintain control over which organizations receive grants and the purposes for which said grants can be used. 14.e. CME will require an application and supporting materials from any organization that it may fund, as discussed in more detail in previous answers. CME will work only with foreign organizations that are internationally recognized and reputable, and CME will undertake all the necessary background investigations prior to supporting any foreign organization. 14.4. See the answers to 14.e. and 13.e. 1.a. CME will offer grants/scholarships for short-term study in domestic and international (primarily Turkey) chamber music workshops, summer programs and seminars. CME may also offer grants to support chamber musicians and composers who have been accepted or invited to participate in internationally recognized chamber music festivals, but are unable to participate without financial assistance. The type of programs CME intends to focus on are workshops ranging from two to ten weeks in duration. 1.b. The purpose of the grants is to provide assistance to individual music students to make it possible for them to attend chamber music workshops and programs for study abroad. These workshops and programs are essential for musicians to increase proficiency on their instruments and also to enhance their understanding of the global musical community and the musical traditions and influences of other parts of the world. The grants will be used to defray the student’s cost of enrollment in the program or travel costs. CME anticipates awarding grants in amounts between $300.00 and $5,000.00 per individual, depending on many factors, including the proposed uses, the event, the need of the student and the financial means of CME. 1.d. CME will publish its scholarship and grant opportunities on the internet, in chamber music journals, and in university departments with international travel programs related to chamber music. 1.e The specific solicitation or announcement materials will depend on the specific scholarship or grant program. No specific materials have been developed yet. 1.f. No specific application materials have been developed yet. 3. CME’s grants will be available to professional chamber musicians, composers and music students. The grants will be awarded on the basis of a combination of the individual’s financial needs and skills. The applicant will be required to submit an application that indicates, among other things, the internationally recognized workshop, program or festival that they have been invited or accepted into, the financial requirements of the program and an explanation of their financial need. The applicant will also be required to submit a CD recording of a recent live performance so the selection committee can evaluate the application. CME’s selection committee will review the applications, including both the applicant and the program for which the applicant seeks funding. The selection committee will consist of two board members (initially, Ellen Jewett and Greg Hesselink) and three musicians who are not on the board. The three outside members of the selection committee will be appointed for one-year terms by the CME Board of Directors. Potential outside members of the selection committee will be well-known and respected members of the chamber music community that are reviewed and voted on by the Board of Directors. CME will solicit recommendations for committee members from the chamber music community. The selection committee will determine if the program for which the applicant seeks funding is a legitimate and internationally recognized chamber music program. The committee will also decide if the applicant meets the financial and artistic qualifications before awarding a grant. 4.a. See the answer to number 3, above. 4.b. CME will annually determine the total amount of financial support it can provide, based on available funds after factoring in expenses, maintaining a reserve and other factors the Board may determined. The determination will be driven primarily by the amount of donations CME receives. CME will also have the right to revaluate its annual determination at any point due to an influx of donations, changes in market conditions or other unforeseen factors. CME anticipates that it will create more specific guiding policies once it more firmly begins operations. 4.c. The amount of each grant is expected to range from $300.00 to $5,000.00 depending on the proposed use of the money, the financial need of the applicant and quality of the applicant. The selection committee and/or the Board of Directors shall have control over this determination. CME anticipates that the Board of Directors will establish more specific guiding policies at such time as CME is able to fund grants. 4.d. Please see the answer to question 3 for more information. CME will require the applicant to use the grant for the specific program identified in the application. CME will also require that the applicant write a post-program review and evaluation, which will describe the event and the applicant’s personal development. 5. CME will take all reasonable steps to ensure the grants are being used to further its exempt purposes. For example, if the grants are awarded to cover tuition or enrollment fees, CME will make the award payable to the organization directly on behalf of the application whenever possible. If a grant is awarded to defray travel or other ancillary expenses, CME will require receipted proof as to the use of the funds. This must match the requests stated in the application.